David was born in 1944 and lived with parents, dad Charlie and mum Rose, older brother Jim (born 1931) and older sister Joan (born 1929) in No 21(originally numbered 8) New Road. At the end of New Road was a small lane called Fred’s End, where the original intention had been to swing the road round back to the High Street. The road was surfaced and they used to play hopscotch on it. 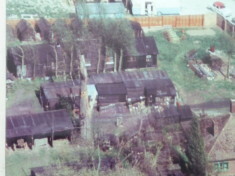 Behind New Road there was land with allotments on it, shown in a 1961 aerial photo. David’s family kept chickens and would go gleaning for grain for them in the fields there. David’s father and uncle had run away when young to join the army and spent time in India. They were born in Newton but later moved to Harston. their Aunt Nell lived in Sheepshead Row, then moved to Manor close. David got married to first wife, Carol, in 1964 and lived in a caravan for 5 years while they saved up money. They were able for a small rent to put their caravan on land owned by Charlie Rogers (the baker) behind the grocers shop at no. 29 High St. (The general stores/grocers was first run by the Wares, then ‘Grinner’ Sargent. It had a shop selling fishing tackle and wicks for lamps next door.) There were two other places down the lane, the Laws living in one. They then bought some land in Meldreth, where he and Keith Willers built two bungalows. David was working for Fred Willers then. After 7 years living in Meldreth he moved back to Harston and lived in the High Street- no 157 where he lived with second wife, Pat. They then moved in 1989 to no. 53 Station Rd, on the corner of Lawrance Lea, having bought the bungalow from Mrs Thompson. When David went to Harston school Mr Royston was the headmaster, and he along with others boys, would get the cane, usually for stained hands showing they had collected walnuts from Royston’s tree. Teachers he remembers are Mr Frost, Mr Johnson, Mr Kirkham, Miss Jackson and Mrs Barnes. Mr Shoot was his 2nd headmaster. Mr Howsden was the first woodwork teacher, Mr Street the second. The art teacher was Mrs Sharp. She lived in a caravan in Button End near the cemetery. David went to school with Brian Thompson who lived in Station Rd where David himself now lives. They had a chicken farm and there were lots of chicken sheds behind the bungalow. Where Lawrance Lea now is there was a field. He enjoyed going into the Lawrance blacksmiths and working the bellows. Harry Lawrance would do mainly shoeing of horses, repair of farm equipment but also household equipment such as saucepans, kettles, etc, that needed a piece of metal. They were mended in those days, not thrown away. He was a general smithy then, moving into wrought iron later. When David was young, about 7-8, his father would take him for a drink in a local pub on a Sunday but he would have to drink his Vimto outside as children weren’t allowed in. He remembers the different landlords- Griggs in the Three Horseshoes, Gladys Asby in the Queens Head, Bert Morrison in the Coach & Horses and Bill Beadle in the Old English Gentleman. Joan Hatcher had the Pemberton Arms- her husband was one of the first instructors for The British School of Motoring. Some time after them came the Stanions, then later on the pub was changed to a Freehouse by John Lumley/Langley which is when Gerry & Jean Cook bought/sold the Pem to Marstons. One of David’s jobs when young was to take the accumulator (battery) for their radio to the local garage, run by Sabbertons, to get it recharged. There was Pye’s electrical workshop behind the garage. Pyes also were in Green Man Lane in the Oddfellows hall and in the Baptist Chapel where his sister Joan worked. The Mumfords shop was in front of the Oddfellows Hall, on the High St and he remembers going there to buy wax crayons- they melted easily if you left them in the sun. The Willers family used to have a punt house on the river below River View and Fred Willers taught David and others how to swim there by attaching a rope round their waists. They also used to swim at the back of Harston Mill and in the Hauxton river. In those days the river were different as they were dredged every two years to remove the silt. Wilf Collin’s father (Fred) and Catherine Warren’s father, Harry, used to do the ditching around the village, maintaining them all the time as a full time job, to avoid the flooding that we get today. Mrs Warren worked in the school kitchen’s and Mr Warren worked as a gardener at the Manor. They lived in one of the council houses in the beginning of Button end next to Gerald Ives. There were also people who felled trees. Mr Howe, who lived near Frank Swan, would cut large trees down by hand and supply for firewood. He remembers seeing a tree cut down near (Willers) Walnut Cottage & where Bill Wright lived. Eli Northrop would keep the streets clean & tidy – he would wheel his cart up one side of the high Street one day and down the other side the next. David went to a youth club at the Baptist church (first called Twinkle there by the Pastor). His mum was a regular attender, but his dad wasn’t religious. He also went to a youth club in the village hall started by the Rev Mansfield Williams. David played football for Harston when he was 13 and can still remember the names of all those in his team. They played football (just one pitch) in The Park, land owned by Col Hurrell. This caused problems as cattle were still grazed on the land and they had to clear the land before they could play- even though the teams were in the Premier Cambridge League. Every week David would mark out the pitch. He remembers receiving a trophy for their second team success (he was captain) in the early1960s, shown in the Cambridge Evening News. Because of the problems associated with not owning their own grounds the football ended for a few years. The new pavilion in the Park which eventually replaced with an old one is now on Andy Bowden’s land; moved after Harston eventually got its own recreation ground. David also played cricket on The Park. They had a good pitch as this bit was fenced off from the horses. The cricket teams won many cups. Bill Ives, in particular, was a brilliant bowler. David recalls there was the base of an old building (old guard post) in The Park field, just to the right of the entrance to the Drift track. When making tea in the cricket pavilion or painting the white lines people used to go to this old base where there was a pipe which supplied water- may have been an old standpipe? Check with Jim. David remembers his brother Jim & wife playing tennis on the courts behind the Village Hall. Many people played on the two courts there in the 1950s until the land was sold in the 1960s for the Telephone exchange. David also was allowed into the Men’s room in the Village Hall when about 10-13 (1954-7) where he remembers the snooker table, which was later sold. David worked at Park House farm from age 10-15, along with Bill Wright. Horses were finishing being used when he was about 12 and he only led one once. He would ride the horses that pulled most of the machinery-ploughs, etc, and did hedging and ditches, as well as helping with all the manual work involved in getting the sugar beet crop. Farm equipment had been geared to horse use but Col Hurrell eventually bought tractors. David did tractor driving- although he wasn’t allowed on the road so Col Hurrell would drive it across the road and David would continue driving it on the other side. There were stables round the back of the Farm for the cart horses but Col Hurrell had his own special horses for show jumping so the stables for these were by the house. There was a riding school later on at The Park. Behind Park House were greenhouses and hothouses with furnaces where David could pick tomatoes for them all year round. There were also peach trees grown against a wall. There were some orchards behind but David helped dig up some of the trees to create more grassland. Ganger Oakman would come to do the hoeing of sugar beet, then Bill Wright would have the harvester which cut under the roots, then horse drawn or tractor equipment would pull the beet up in a line, someone would top & tail them and put them in a heap. Someone would collect them in, using a special beet fork that had lumps on the end of the prongs so they didn’t dig into the beet, and put them loose in a trailer to be taken to the station where they would be loaded by hand. David would help pile up the grain into stooks/shocks. The grain would be stored in the barns behind Park House. The Hurrells had all the land/fields east of the High St up to London road and the bridge, and even some down Donkey Lane. In addition to sugar beet they also grew mangle which was like sugar beet, and when mashed up and mixed with ? it provided feed for the cattle. Some fields to the south of the Drift were meadows for the cattle. They would collect hay from the meadows for animal feed. They would put the hay down in a layer then cover it with molasses and leave. Later they would cut some of it with a large knife to give to the cattle for feed. In winter they brought the cattle in from the meadows and kept them in the yards behind Park House. They would clear out the yards at least twice a year and put the manure back on the land. Col Hurrell left the farm to his son William. David and William, as boys, used to go shooting on the farm. William’s sister Martha had a white pony called cobweb. When she was older she would help with the harvest, as did many others, including Peter Shoot, Albert Lawrance (Mary’s brother), Ralph Lury. Frank Swan also worked at Park house at one time. He did have his own smallholding, though, with orchards which went back a long way from the High St. Frank’s grandson Davis Clarke went to the Grammar school. His sister got knocked down by a car. Next to Frank lived Em Lou Banks (related to Banks farmers of Eversdens) who had the house where Jenny Embrey now lives. Lots of youngsters helped on the farms in their summer holidays and earned a few bob. Quite a few did fruit picking at Barrington for Eastwoods. The manager was Bert Morrison (one time landlord of the Coach & Horse) and he would pick up the youngsters in Harston and take them to the fruit farm in Barrington. Beech farm had arable fields and lots of cattle- milk cows. Freddie Harris (David’s friend)’s dad was the cowman and they lived in Beech Farm cottages. Keith Crow (died 2014/5?) managed Beech Farm (owned by Jesus College), and his dad before him. Keith’s brother Liam farmed in Bourn, but was also a Harston cricketer. Len Wisby worked for Col Hurrell and lived in a cottage by the stables. The Willers lived in one opposite. Two of the children had TB and had to sleep in a hut in the garden to get the fresh air. David became an apprentice for the Wisbys, a Haslingfield builder, in 1959, age 15. 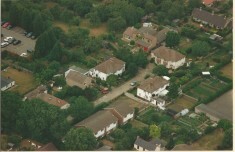 There were a number of Wisbys in this family- Joe in Haslingfield, Jean Wisby who married Peter Rowell who lived in London Rd, Harston, Bill Wisby had the gravel pits in Hauxton (behind London Rd), and Stan Wisby lived in the High St, near the Lury’s (he knew their son Ralph), near Sabberton’s garage. Peter Rowell had Camcrete- making concrete lintels, etc down Button End where Centenary works now is (with two independent carpenters workshops still). Fred Willer’s brother Ernie had previously taken over the joiners business there. David remembers the Thompson family living at Trigg Farm in Station Rd. They were also coal merchants delivering to the whole village. Behind the farmhouse were a number of different piles of coal graded according to their quality. Alongside the driveway was a railway carriage where some members of the Thompson family lived, including Philip Thompson who helped deliver the coal. In the cottages to the right of the driveway on Station Rd lived Peter Aldiss who went to school with David. Mr Cairn, the eye surgeon lived next door. One vehicle seen in a photo behind Tirgg farm probably was labelled Jack Branch Plant hire. As David got married in 1964 he recalls John Ives returned from abroad then and bought the garage from Ron Bass and ran it with Truslove for 3years. Then Alan Mills took over. His father had lived down at the bottom of Sheepshead Lane and Alan built himself a new house behind the garage in the late 1960s, which is still there. Daniel Segrave ran an agricultural contract business hiring out farm machinery from Charity Farm just beyond the boundary of Harston. David Stocker’s father ran an agricultural business, with caterpillar tractors, from a workshop where stables now are in the field behind Harston House on Church St. Stocker’s also had a car sales auction place in the High St to the left of where High Meadows now is. This was before the Chapman’s bought the land and put caravans on it before building two houses. Frank Chapman bought and sold cars while his brother Neil did body repairs and did turfing. Frank’s daughter Jean married Pete McKensie of Kensies Coaches. Neil had 5 children, Joyce who married Vallis and died in childbirth, Fay, Michael, Neil and Terry. For a short while Joyce had a clothes shop by the Coach & Horses, where Charlie Rogers used to have an electrical shop. There was also a men’s hairdressers there for a while where David had his hair cut. While David was at school, George Knight built a house to the right of the Green Man around his grocers shop which was in a shed like the Oddfellows Hall. He did this while working at Pest Control in Hauxton. George’s wife was Mary? and they had two daughters, Jane and ? There was an RAC box by the Old English Gentleman when Beadles were the landlords. People had a key to get into the box to use the phone. This corner in Harston was a staging post for the cycle racing that went on in the area. People could stop and get a drink if they wanted. The Beasleys used to live in Byways where Peggy and Albert Dainton later lived. Joan & Mr Good lived in the PO opposite the Coach & Horses. Had two children Molly & Ann?/Jo? (Andrew!) They moved to the Lake District where David visited them. This page was added on 30/07/2016. Not quite correct about the tenants in the PO opposite the Coach and Horses as it was Joe and Molly Goode and they had two sons Andrew and Neil. Lovely memories. You mentioned my dad to, Neil Chapman (Junior) who sadly passed away in 2013. Think one of the Landlords of the Pemberton Arms back in the 70s was John Lambly, I remember as used to be friends with his daughter Louise and used to have sleep overs in the pub. Happy memories. Thank you for sharing. Gus Baker was the manager at Eastwoods fruit farm, Albert Morrison worked in the office there. In the early 60’s my father, Eric Flowerdew took over the manager’s job at the fruit farm when Gus Baker died and Albert Morrison continued to work in the office. The landlord of the Pemberton Arms was /Stanyon/ not /Stanion/.